Warrior and Royal Guard look excellent, now if only they would implement Giger's Alien it would be worth a purchase. The Queen and the Power-Loader square up. Gmorts Chaotica and Farsight Blogger were on hand to get us our best pictures of the final models from Prodos Games’ first wave for the game. A recent post of Prodos Games’ Facebook reveals that the game will soon be available for pre-order. Hopefully this means those of us who pledged to the Kickstarter will recieve our models soon. I can't wait to get these in the post. I'm hopeful I'll have a place to play it now at Titan. now if only they would implement Giger's Alien it would be worth a purchase. 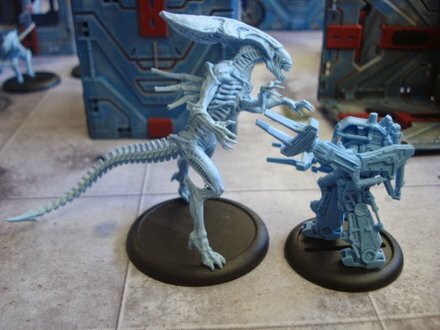 Lol, guess you'll never know the joy of the AvP Miniatures Game then. Guess so, I decree anything trying to portray the AVP designs as "Infants" will not exist in my home. AVP designs come from A:R and A:R is where I believe they should stay. I'm glad film-makers generally at least have style. Just pray that whoever makes the next "Alien" film keeps the films in mind. Well you're right on that front, especially as we only got recycled ADIliens in AvP as a cost-saver. Having said that though, I think that iteration of the Alien is going to be official for quite some time. While I love the original creature and its' design, I think he's more or less "retired" now (barring Isolation). At least the Warriors are more Cameron than they are AvP:R... although they're still pretty AvP:R. Just a lot nicer than I was expecting. There were 100% Cameron versions floating around as concept renders (which would have only needed a minor bit of work to make into a Giger Alien), but presumably Fox didn't like them that way. We just need another hit "Alien" movie with well designed Xenomorphs, and it's been what... Ten years since AVP? I think for one the AVP design will only be sticking around until there's either Xenomorphs in Paradise or as I said another standalone "Alien" film. I'd say in their simplicity the AVP Aliens would simply cost less to make and be easier to sculpt also. Well at least we aren't getting the mummy faced aliens from AVP 2010. Remember with enough support, anything is possible. If this game launches strongly and Prodos can make enough money, they might be able to pitch to FOX that the fans want more... Giger's Big Chap, City Hunter, Lost Tribe, larger vehicle models like an APC/Dropship... whatever the desire is, all they need is the revenue and the input from the fans and they can pitch it to FOX and hopefully get approval. Money talks, so get all your friends into AvP or models to pick up this game when it goes on sale. New pics are in and are fantastic. Can't link from my phone but they're linked on the avpg facebook. These were posted by Titan Games, the place they did the preview at the weekend. I do believe they're pretty tight with Prodos and I do hope they run some events, they're pretty close to me. Photography doesn't show off what appears to a be a harlequin effect on the carapace to the extent one might desire, but it's so nice to see the swarm painted anyway. Thanks for posting them here Hicks, I couldn't see them properly on facebook due to my phone being stubborn right now. Photography doesn't show off what appears to a be a harlequin effect on the carapace to the extent one might desire, but it's so nice to see the swarm painted anyway. I have no idea how I'm gonna paint these. They're so different to the spaceship models I've painted. Yeah. It seems to blur into blue and then black very smoothly. I'm wondering whether the painter used a forced effect and painted those colours onto different angles, or if they used a special paint to get that "petroleum on top of a puddle", harlequin look. Not sure what you're after with them, but I have a lot of experience painting this style and size of figure, and would be more than happy to offer tips and advice. I know a few other members here are pretty talented TTG hobbyists too. Were you still thinking of making a sub-forum for this game upon release? I reckon it'd be a good place to share our work and help each other with concepts and techniques.